I woke up by the cockcrow of a rooster. No, not the electronic one programmed to wake me up at 0520 Hr, but one of these psychopath roosters, which tend to cry out that they are still alive, two hours before sunrise. The smell of a good chicken soup tempted my nostrils. This calls to vengeance. I had a bad night sleep, probably too tired from the first track and this damned rooster did not make me feel much better. I turned over and over in bed until finally duty called. Zombie was the name. I did not know where to start first. I unplugged the GPS battery charger in order to cool down the batteries. The 7/11 breakfast - the last bread with raisins in the rack - went in difficult. I pushed it through my throat with a pack of chocolate milk, followed by a bar of chocolate stuffed with nuts and raisins. Too early for breakfast, my stomach was not yet awake. I knew I had to eat; to eat a lot in order to have enough energy for the day. The first pot of yogurt was quickly empty, the second was more like a fight. I started already to hate these early morning rises, hurrying to start off in time. Steve was out at first, something he would be the whole trip long. He was an early riser, and I suspected him to be a mate with that rooster. I didn't hear him leaving the room with his bike; no noise, no slamming or creeping of a door. Six o'clock. I stuck my head out of the door. No Steve. I took my bike down the steps and there stood my biking partner, completely dressed up ready to take off. I was the one who was late. Bloody rooster. We jumped on our iron horses and passed the hotel gate around 0615 Hr. Sun light started to poor in and we biked through the still empty town towards road # 311 and Chai Nat. After having warmed up, we went into Steve's "Tour de France"-mode, switching the lead every 2.5 kilometers and taking a rest after having done about 20 K's. We made a short stop in Prasuk area, north of In Buri and not far from the provincial border between Sing Buri and Nakhon Sawan at 0720 Hr - just the time to fuel up and stretch. Five minutes later we were back on the road again. We continued over In Buri to Sapphaya, in which location we took a 10-minute break at Km 40. Below Chai Nat we changed from road #311 to #3183 straight up to Uthai Thani. 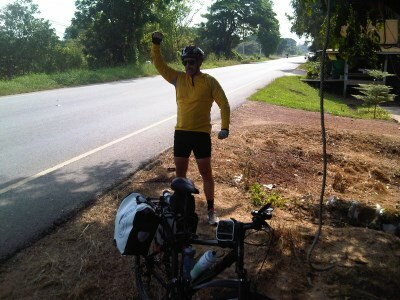 We took a third rest at Wat Sing around 0945 Hr and a fourth one at Km 80 when we passed the provincial border between Chai Nat and Uthai Thani. And there it occurred. Steve's derailleur started to behave in a strange way. The thing was making a lot of noise and the derailleur moved position all the time. He thought he had seen some metal object going into his cassette and made some damage. There was nothing much we could do and we decided to try to make it to our second destination point. 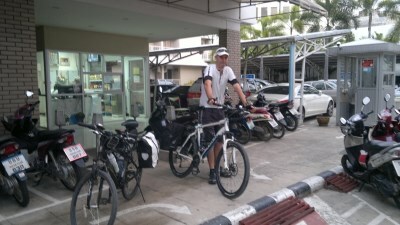 We arrived around 1100 Hr at the Phibunsuk Hotel in the heart of Uthai Thani. The hotel must have dated from the period of the Vietnam War as it had much resemblance with some older hotels in Bangkok. Outside it looked more or less all right. Inside you went back in time. The doors of the rooms were opening to the outside. The ventilation window of the bathroom gave out into the corridor; the silence of the walkway sometimes broken by strange noises. The garbage can was still the old spittoon and the furniture was modern in the 60's. We chose two "deluxe" rooms. The friendly girl at the counter smiled, from which I deducted the "deluxe" was not often sold. All by all not too bad; the rooms had air-conditioning, satellite television, hot shower and a refrigerator. There was no restaurant at the hotel so after a freshen-up, Steve and I were roaming the streets to find some eatables. We ended up in a sushi-shop not far from the hotel. After consuming some Saba fish with Japanese rice and emptying a box of sushi, we returned to the hotel. Steve went inspecting his bike and I joined him. The culprit was quickly found. One of the outer chain plates stuck out. Steve tried to re-position the plate, but could not fix the chain pin in position. I had my concerns, so I suggested Steve to find a bike shop. I asked the girl at the counter and she drafted a map, indicating a bike shop nearby. Steve went off. I went out in the afternoon on temple hunt. I visited Wat Rong Kho, Wat Phichai Puranaram, Wat Mai Janthararam and I hurried to Wat Ubosotharam as dusk started to set in. According to a legend, Thao Maha Phrom built a city at Ban Uthai Kao (Nong Chang sub-district) during the Sukhothai Period and brought Thai people to settle among the Karen and Mon villages. The place was called Mueang U-Thai after the group of the Thai people. Later, a drought changed the course of the river, and people left the city. In the Ayutthaya Period, a Karen named Phataboet came to restore Mueang U-Thai. He excavated a lake near the city and became the first ruler of the old Mueang U-Thai. Afterwards the name of the city was changed to Mueang Uthai, according to the Karen accent and functioned as a defensive outpost for the city of Ayutthaya. After the fall of Ayutthaya in 1767 AD, settlement occurred along the banks of the Sakae Krang River in this area, which led to the establishment of Uthai Thani today. I met Steve at 1800 Hr. He had visited the bike shop and the owner, looking the damaged chain, said no more than "Oh Oh". Luckily Steve had a new chain as a spare part and the owner, with the help of a special tool, installed it in a fraction of time. Free service, no money asked. Steve's bike repaired, no much worries to care for anymore. Steve was counting his lucky stars after this event. To bring a spare chain was a last minute thought, and most cycling shops and cycling enthusiasts suggested that breaking chains was extremely unlikely and it isn't necessary to bring a spare. I had asked the counter girl were we could have some decent food and she indicated me on the map the position of "Nai House"; so Steve and I were on the streets at sunset looking for Nai House. Steve checked the map on his Blackberry and murmured something that I understood as Nai Pan, which after asking around became Thai Pan and finally we stood at Uthai Thani's main road. No restaurant met. We were running around like "chickens without a head" in a virtually deserted town. If you do not understand the last, I will explain. At young age I saw a member of the family, who - in order to prepare a chicken for lunch - hung the animal up at a pole and with one kick of his axe decapitated the chicken. Now, the part without the head fell on the ground and started to run off in a zigzag way, turning in circles all around the garden. It is a picture still deeply burned in my mind. Forgive me my horrific explanation. Finally we arrived at Nai House, which was in fact Night House, a bar which opened only from 2100 Hr on-wards. We had to look for a real kitchen and with some more asking around we landed finally at Phuen Restaurant. 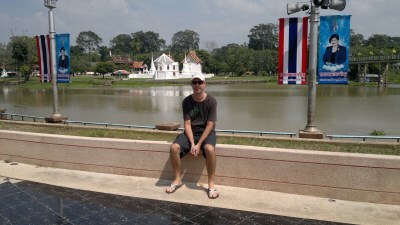 Obviously Uthai Thani had a lack of decent restaurants and was definitely not a tourist town. We stepped inside the restaurant together with some other people and we saw there was a party ongoing. The owner believing we were part of it wanted to put us at the head of a table of twelve. We must have looked a bit funny as suddenly he understood we were not part of the event. After the table and seats were freed from some objects we got a hidden seat in a deep corner. Cannot remember too much about the menu, but we could fill our stomachs. As it was close to 2030 Hr, we decided to go back to the hotel. Streets in and out we managed to arrive at Wat Phichai about one hundred meters from our hotel. We made a quick visit to the 7/11 in order to buy our breakfast. 2100 Hr, the bed was calling. Day two passed by; 162 Km of eating dust and still many to go.